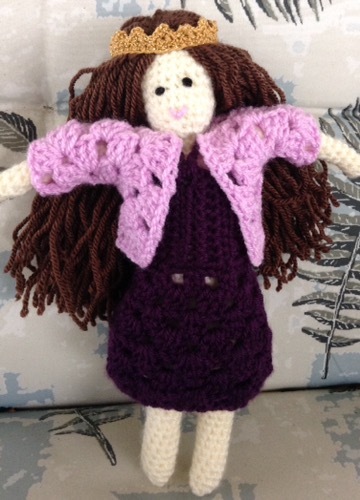 This is a quickie post to show you my finished doll, as promised. 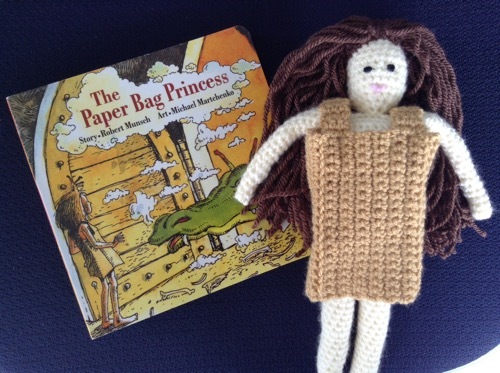 The photo with the board book was taken before I made her crown. Luckily I found some Aunt Lydia’s crochet cotton in gold so that the crown has a bit of sparkle. I dug out a 1.5mm hook for that, which I bought in 1983 in Greece. Amazing that I still have it. The crown is sewn on in four spots so that it doesn’t get lost. The dress is from the Princess Poppy pattern, though I didn’t need as many rows as the pattern suggested for the bodice. It still worked out fine. I was disappointed that there was an outside link for the granny shrug that was broken, so instead I searched Ravelry for a hexagon baby jacket pattern and worked the first three rounds. I didn’t bother with knickers or shoes. We booked our summer holiday today. Two weeks in Switzerland to visit with some of Tai Chi Man’s relatives and enjoy some beautiful mountain vistas. Very exciting! Do you have any travel plans?